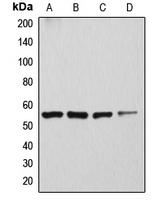 Western Blot analysis of ATP6V1H expression in transfected 293T cell line (H00051606-T01) by ATP6V1H MaxPab polyclonal antibody.Lane 1: ATP6V1H transfected lysate(53.13 KDa).Lane 2: Non-transfected lysate. 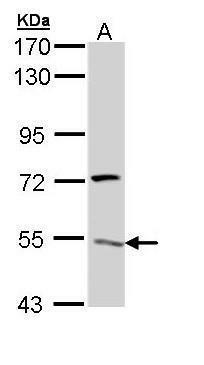 Western Blot analysis of ATP6V1H expression in transfected 293T cell line (H00051606-T02) by ATP6V1H MaxPab polyclonal antibody.Lane 1: ATP6V1H transfected lysate(55.90 KDa).Lane 2: Non-transfected lysate. 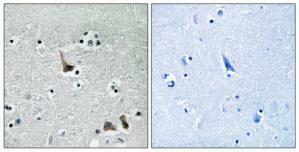 Immunohistochemistry analysis of paraffin-embedded human brain tissue, using ATP6V1H Antibody. The picture on the right is treated with the synthesized peptide. Western blot analysis of ATP6V1H expression in Caki1 (A); SKNSH (B); rat kidney (C); mouse brain (D) whole cell lysates. Sample (50 ug of whole cell lysate). A: Mouse brain. 7.5% SDS PAGE. TA307969 diluted at 1:1000. Sample (30 ug of whole cell lysate). A: Hela. 7.5% SDS PAGE. TA307969 diluted at 1:1000. Immunohistochemistry analysis of paraffin-embedded human brain tissue using ATP6V1H antibody.The picture on the right is treated with the synthesized peptide.